The city witnessed multiple private equity deal closures in the residential, commercial and retail segments. An influx of institutional finance is expected to improve real estate sentiment. Blackstone is amongst the biggest fund-raisers in the city. BDA has further delayed the release of the city’s Master Plan 2031 after the initial January 23rd deadline. The final report of the Revised Master Plan (RMP), which was to be released by May-June 2018, will now face a delay of around six months, leaving the city’s development dependent on the timeworn RMP 2015. BDA has partnered with private developers to rebuild seven commercial complexes located in Indira Nagar, Koramangala, HSR Layout, Sadashiv Nagar, Vijay Nagar, RT Nagar and Austin Town. The 10-km long Peripheral Ring Road-II between Magadi Road and Mysore Road cleared its final hurdle with BDA managing to acquire the required 321 acres of land from farmers. Post this breakthrough, work on development of Kempegowda Layout is expected to start soon. Out of the 2,100 project applications received, Karnataka RERA approved more than 1,500 real estate projects, with majority of them located in Bangalore. Additionally, approximately 1000 agents/brokers, too, have been registered under the Act. The period post the implementation of Real Estate (Regulation and Development) Act (RERA) and Goods and Services Tax (GST) has got financial institutions and developers go gung-ho for the future of real estate. 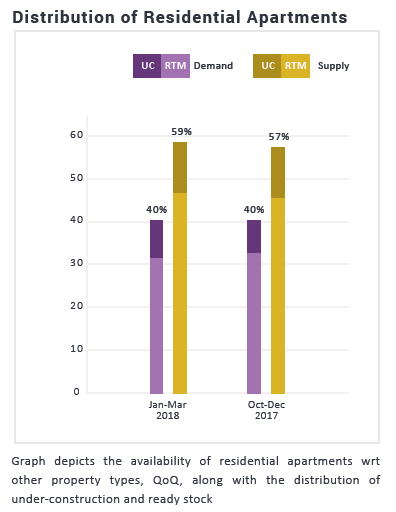 This inherent optimism reflected in Bangalore realty’s quarter-on-quarter performance with regard to residential price points and buyer sentiment. The city closely followed Delhi NCR and Mumbai in attracting investments in the residential space due to relatively lower risk, presence of branded developers and robust housing demand backed by commercial expansion. New launches, too, resurfaced, as developers exhausted their promotional plans towards offloading the existing stock. Favoured areas witnessed new project announcements from several Grade A developers, all enlisted with RERA. The city witnessed an addition of more than 20 new residential projects in the first quarter of 2018 alone. This is a complete contrast to the meagre numbers reported in 2017, suggesting a brighter story for Bangalore’s real estate in the ensuing quarters. The rental market remained the prime gainer from the multiple events of the past, with East and South zones reigning the demand charts. A low Grade-A office vacancy rate of 2.9 percent held the baton to the burgeoning rental market across prime locations such as Whitefield in the East and Electronic City in the South. Undeterred by the piling residential stock in select pockets, the East and South zones managed to stand resilient to the uncertain market forces elicited by snail-paced project registrations process under RERA. Robust commercial expansion kept stakes high for residential investments, resulting in the zones to maintain status quo in the current quarter. Residential real estate activity in East and South zones remained concentrated towards the IT hubs and transport corridors. Kanakapura Road and Hosur Road in the South ruled the roost with growing interest from buyers and developers. While both enquiries and sales improved against the previous quarter, there was no notable price appreciation. 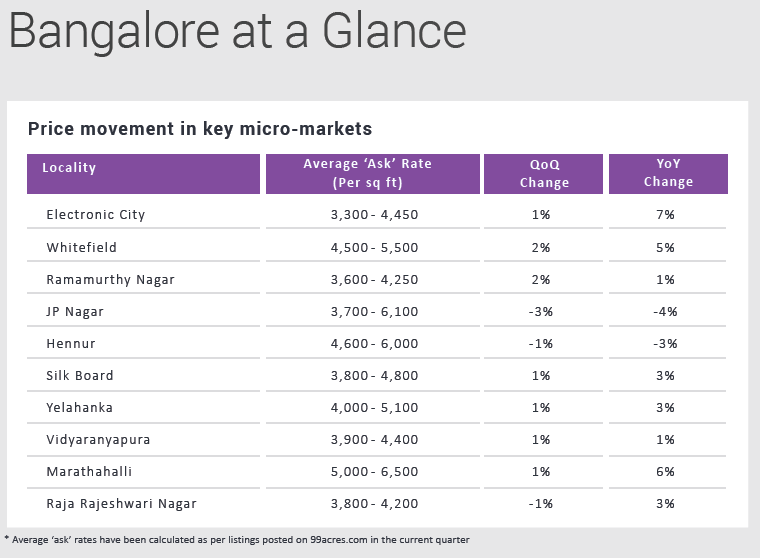 East Bangalore clocked a marginal upward price revision due to ambitious ‘asks’ in the secondary market triggered by burgeoning enquiries. Well-developed locales such as CV Raman Nagar, Mahadevpura, Banaswadi and Ramamurthy Nagar witnessed average prices going north by two to four percent, QoQ. New project launches by reputed developers continued to keep the ante up in the IT hub of Whitefield, where prices appreciated by two percent in the current quarter. Locales along Hosur Road, which saw dwindling sales in the previous quarter, seemed to regain foot post Bruhat Bengaluru Mahanagara Palike (BBMP) elections. Residential ‘asks’ in areas such as Singasandra, Begur, Harlur and Electronic City went north by an average of one to four percent, QoQ. South Bangalore commanded a lion’s share of demand for budget homes owing to robust progress towards affordable housing in locales such as Doddathoguru, Kodichikkanahalli and Gottigere. Poor conversion rate, however, prevented prices from appreciating. The rental market, like previous quarters, remained unabated and posted a two percent growth between Jan-Mar 2017 and Jan-Mar 2018. Locations offering affordable rental inventory such as Bommasandra and Subramanyapura in the South and Ramamurthy Nagar in the East topped the charts with eight to nine percent hike in rental values, YoY. The recently started suburban train services between Baiyappanahalli and tech-hubs Whitefield, Bellandur and Electronic City are expected to thrust ‘asks’ north in the ensuing quarters. Locales such as Hosur and Banaswadi, which have reported minimal rental appreciation in the last one year, are also expected to benefit from the improving connectivity. The capital graph across North, West and Central Bangalore tread a steady growth path. While North benefitted from the gradually expanding commercial IT base coupled with transport corridors, the western quadrant remained popular amongst budget homebuyers. Demand-supply mismatch in central areas was the prime factor triggering growth in average weighted capital prices. Transport corridors continued to be the focal point of real estate development and transactions across the zones. While Thanisandra Main Road and Bellary Road took the lead in North Bangalore, Tumkuru Road emerged as the hotspot in the West. Mysore Road, too, garnered buyer attention owing to the metro and road expansion projects. Availability of ready stock helped Hegde Nagar, Thanisandra and Jakkur report positive price movement up to four percent in the current quarter. Alternate road from the Kempegowda International Airport exit gate eased commuting to these localities along Thanisandra Main Road, uplifting the livability index here. Areas along the Bellary Road, such as RT Nagar, Sahakara Nagar and Hebbal, witnessed average weighted capital prices firming by two to four percent, QoQ. In addition to their strategic location near the expanding IT corridor, the housing pockets are also gaining popularity owing to the proposed Special Development Zone and the planned metro connectivity under the Revised Master Plan 2031. Hormavu and Nagavara, too, recorded a hike of two percent, each, in average weighted capital ‘asks’, QoQ. The metro proposal along the Outer Ring Road (ORR) led to ambitious ‘asks’ in the resale market. While the upmarket RMV Extension witnessed a hike of four percent in property rates last quarter, the capital market countered a marginal price correction in Jan-Mar 2018. Poor response from buyers due to inflated prices led owners to revise ‘ask’ rates. The rental landscape remained positive with a three percent hike in average rentals, YoY. Affordability continued to be the driving force for majority of the tenant community, impacting rental rates in locales such as Jalahalli, Yelahanka, Hormavu Agara, RT Nagar and Vidyaranyapura in the North. Towards the West, Kengeri ruled the roost with lease rates as low as Rs 12,000 per month for a 2BHK apartment. A fair share of the tenant community also held the penchant to stay closer to the city centre. This pushed rental values in Cox Town and Ulsoor by seven to ten percent, YoY. The Jan-Mar 2018 quarter started exhibiting the long-envisioned impact of transparent governance in real estate. After an elongated lull, demand for under-construction units resurfaced as developers were made to comply with strict regulations under RERA. The stringent approval process and rejection of more than 45 projects in the last three months firmed buyer’s confidence in the Act. Bangalore continued to reel under the pressure of unsold inventory standing at around 42,000 units. Despite this, developers made a comeback with RERA-approved projects, using the status as a bait for long-time fence-sitters. With more than 20 new project launches in the city between January and March 2018, the overall supply of residential apartments went up marginally in the quarter. A majority of the newly launched projects belonged to the mid-income budget category (Rs 40-60 lakh), the second most preferred in the city. This helped the city inch closer to a demand-supply equilibrium in the segment. The supply now remains short of demand by a mere two percent, as opposed to five percent in the previous quarter. Demand for affordable inventory (within Rs 40 lakh) continued to outstrip supply by 16 percent. Poor status of approvals resulting in multiple projects getting rejected under RERA remained key deterrents to the growth in supply of budget homes. As projected in the previous quarter, a fast-paced absorption of homes in the premium category led the luxury and ultra-luxury budget segments (beyond Rs 1 crore) to reach a state of demand-supply equilibrium in Jan-Mar 2018.